Hi there! Please check if we are able to answer your questions below. Click on the question to expand the answer! What are the Macbook models available for your Candy Shields? New Macbook without Touch Bar 13"
New Macbook with Touch Bar 13"
New Macbook with Touch Bar 15"
Do you have cases for White Macbooks? We don't have have cases for white macbooks on hand but we accept pre-order, meaning you will receive the product 2 weeks after you deposit the payment. Our case for white macbooks are available only for the following models: MC516 MC207 A1342. Since the production of white Macbooks have stopped already, the price of the white Macbook cases from our supplier is more expensive. So it's priced at P850 - just the case. We don't have any keyboard protectors or dust plugs available for white Macbooks. Do you have cases/accessories for other laptops like Acer or HP or Samsung? How much are your Candy Shields? What is the material and texture of the case? The Macbook case is similar to Speck. It is hard plastic. Solid-colored and marble cases have a matte or satin finish. Do you have glossy cases? Can we mix and match the colors of our case, keyboard protector, and dust plugs? Do your cases have ventilation or holes underneath? What is a wrist guard? Do your cases have an Apple logo hole at the top cover? 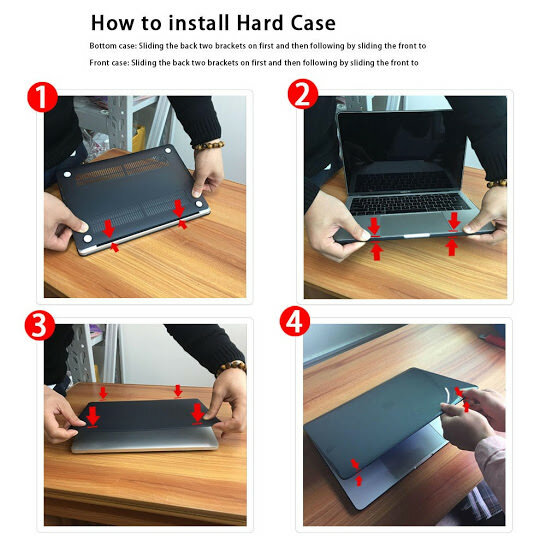 How do you install the case? None, we are just an online store. But you can pick-up your order from Better Living Paranaque if you want. Search “Candy Shield” in Google Maps to know the exact location. Kindly email [email protected] to ask for details. No, we just do shipping to the whole Philippines. To the whole Philippines - to Metro Manila, Luzon, Visayas, and Mindanao. Can my package be shipped to an LBC center? No. Our courier partners Xpost and Zoom currently don't allow delivery to LBC branches. Kindly indicate a non-LBC branch as address instead. Do you have a shipping fee? How much? Yes. Php100 - for Metro Manila. Php180 - for Provincial (Luzon, Visayas, and Mindanao). These are the rates of Zoom and Xpost. What are the modes of payment (MOP)? BPI deposit, BDO deposit, Cebuana Lhuiller, Paypal, and COD. The details (like account name, account number or city) will be sent along with the Order Receipt as soon as you send your order. Do you have other banks like Metrobank? Can we send payment through LBC? Unfortunately, no… We only have BPI and BDO as bank and only Cebuana Lhuiller as alternative mode of payment. Do you do Cash on Delivery (COD)? Yes, we have COD nationwide. Our courier partner for COD is Xpost. Also, choosing this payment option will incur an additional of P50 fee. This is because of the additional fee Xpost charges for COD. Our courier is Xpost for COD orders, and Zoom for non-COD orders. How soon can you send the package / how long does shipping take? If you pay on business day 1, your package will be picked up from our house on business day 2, then count on the number of shipping days will start on day 3. For Metro Manila, shipping takes 1-3 business days. For outside Metro Manila, shipping takes 1-7 business days. Ex: You are from Metro Manila. You send your proof of payment to [email protected] on Thursday. Your package will be picked up from our house on Friday. Soonest you will receive it is on Monday, latest on Wednesday. Do you have wholesaler packages for bulk orders for reselling Candy Shield? Yes. Kindly send an email to [email protected] and we will respond to you in private.